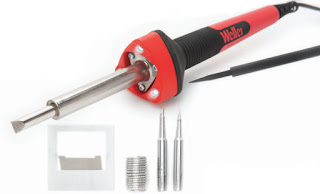 How do you make a Weller high-performance soldering iron even cooler? You add LED lights to it! Among the impressive specs of the new "red dot" Design award-winning Weller High-Performance Consumer Soldering Irons are the three built-in, temperature-resistant LEDs that deliver light to the application. Available in four wattage models (15, 25, 40, and 80) and six packages (the 25- and 40-watt irons are available in kits), Weller's new soldering irons offer light-, standard-, medium-, and heavy-duty solutions. The new irons offer a low-cost entry into soldering for DIY and hobbyists. Weller added the superior-life LED technology to their Consumer Soldering Irons to respond to customer feedback for application illumination. The three high-intensity LEDs provide 30-degree focused light at 25 Lumens/ft2 light intensity with no tip shadowing. With a flashlight strength beam length, these powerful LEDs eliminate the need for an alternate light source. Weller Consumer Soldering Irons include an appropriate tip, iron stand, and user manual. The two kit versions include those items plus a soldering aid tool, lead-free solder, and two spare tips. The new Weller Consumer Soldering Irons are available now at QSource.com. You can also give us a call at 800-966-6020 or contact us via email to place an order or get more info. For other related soldering solutions, please visit our Weller Department.